Ange hurt her back and could not move too well so she had to stay still in bed and could not get to work. TBI has given me the ability to really talk I can talk a glass eyeball to sleep in fact I can talk myself to sleep. With Ange at home needing rest I thought that I should just give her some quiet and disappear for a while. I tell Ange I will be out for two hours or so, “where and what are you thinking of doing?” Ange curiously asks, don’t worry babes I’m just going to go on an adventure I say. So off I go with my wife’s permission now where to I think so I walk and I walk soon I find myself in a taxi. I am on an adventure so there is no destination in mind; I ask the other passengers where does this taxi go? In the back is a huge man he looks at me in curiosity and tells me its destination-Pan African mall in Alexandria. Cool I say so I guess I will head to the mall, I ask him how then do I catch a taxi back once there, he tells me and all is good. We get to the mall and I am probably the only white male around this is fine I feel safe and at ease. I walk around a bit and head to where I can get another taxi back home once at the taxi rank at the back of the mall I notice the large man that gave me directions in the taxi. He waves and shows me a thumbs up I realise he has been following me to check if I am okay. Wow what a good man I get into the taxi and head off to my next destination. I realise that I am now part of the public transport system. Usually I am the one shouting and swearing at taxi drivers but now I am in the second taxi and I feel extremely safe and I am enjoying my outing. What I would like to see is more ordinary white South Africans catching taxis perhaps they may understand how it is on the other side. Perhaps this may also bring people closer to each other just to see and understand the other side. I get home safe and sound, Ange has been able to rest and I had a great day. 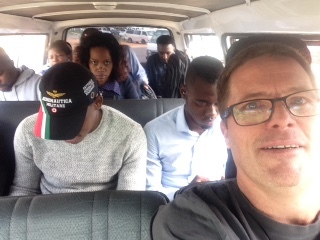 Now where do I go next… perhaps a taxi to Soweto well maybe and why not?